Montague is the world’s leading maker of full-size folding bikes. Montague bikes use a patented design that delivers the strongest folding frame on the market! Montague offers road and mountain bikes that fold in a matter of seconds for the car trunk, train, or closet. Get a FREE Safecastle Stainless Steel bottle with every purchase of over $250 - valid till April 13th!! In a disaster situation people tend to cooperate until they compete. In less than a week situation deteriorated pretty fast after Hurricane Katrina . When there is an emergency freeways are the last place you want to be. Police will setup roadblocks and restrict movement. Mobility will be key to survival, especially the ability to get away from a disaster area quickly when the freeways are blocked. Cars will jam freeways and motorcycles will need fuel that will deplete quickly. Electric bikes on the other hand solve these problems, especially the FAT Tire one with powerful motors to go on any terrain plus these are quite. 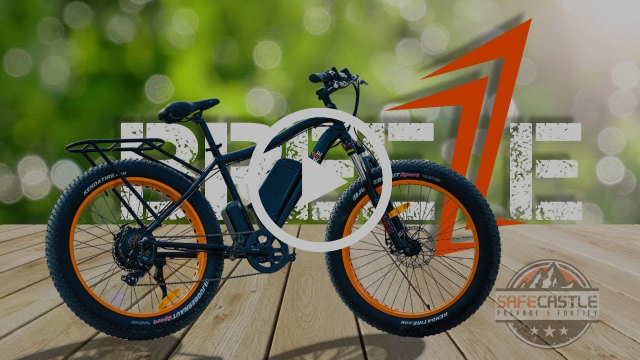 All our bikes come up with 500W-750W powerful motor and 48V long range battery with Samsung cells. Mozo shock absorbers can take any terrain and we have tested them thoroughly. Check out the video below and you will see. A blog about Survival, Preparedness and Outdoors. We are a Survival Gear Outfitter For Emergency & Crisis Preparedness - Safecastle. Yoder's Bacon Backed With Our Best Price Guarantee! Chose Yoders Bacon Ready To Eat ! Case Or Cans. This week’s featured product is Yoder’s Canned Bacon. Have delicious bacon with these easy-to-store cans. We’ve taste tested it and loved it! Yoder’s Canned Bacon will make a great addition to your food storage. 100% USDA Bacon, Packed in the U.S.
Homestyle Canned Turkey- Sale Price!